Just 1 k.m. 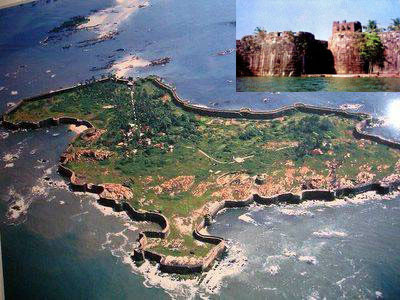 away from Malvan city; this fort is considered as a soul of Hindavi Swarajya (Hindu empire set up by Shri Chatrapati Shivaji Maharaj). If we have to fight with British and Portuguese then we ought to have complete control over sea was realized by King Shivaji and hence he decided to build a fort. When he visited Kurte island he was convinced there’s no other place like this to build a fort. Today after seeing this fort on this island one must feel like offering a salute to this visionary king. On 25th November 1664 after offering prayers to sea god the first stone of the fort was laid. The construction work got over by 29th March 1667. Fort set up over 48 acres of land of is a unique and one of it’s kind example architectural design. The approach to this fort is through ferry boats available at Malavan jetty. Fort wall is built in such a fashion that on first look it’s very difficult to find the main entrance gate. The idea was to hide the main door from enemies to protect it from direct fire from a long distance. Inside the fort one can visit Jarimari Temple, Bhavani Temple, Mahadev Temple and Dudhbav, Dahibav and Sakharbav which are sweet water wells on the island. Inside Mahadev temple is a well which has secret tunnel. Wonder of the nature, a coconut tree with two branches is also very popular amongst the visitors. In one corner of the fort wall are the handprints of King Shivaji embossed in lime. Shivaji maharaj’s only temple in Maharashtra state “Shivrajeshwar” is also a part of this fort. King Shivaji’s statue without beard inside this temple is in a Navadi’s (sailor’s) get up. Rajaram Maharaj in year 1695 got this statue built in this temple. The remains of the wrecked meeting room is a must see. The amazing sea view that one can see from here is just awesome. This fort is built 2 k.m. inside the sea and can be visited throughout the year except for rainy season (June – August). Travel Konkan! See the unseen!